It’s always a good time to surf. In 1986, The Legend of Zelda presented an open world, provided virtually no direction, and generally carried a “figure it out, you idiot” attitude. Many video games of that era refused to hold your hand, in fact. However, over time and due to a number of factors that could probably warrant a separate article, hand-holding became more prevalent in video games. Tutorials and hints are commonplace in games now, making for more comprehensible–but also less dynamic–game experiences. It’s a perpetual struggle for developers to insert tutorials without disrupting the flow of gameplay, or to decide which hints are truly necessary to prevent player frustration or confusion. The Zelda franchise itself has gradually inserted more hand-holding, beginning with the nagging Navi in 1998’s Ocarina of Time. Breath of the Wild however seemingly achieves the impossible: It returns to the “figure it out” attitude of the NES era while retaining the comprehensibility of other modern games. The game has very few genuine tutorials, and those that exist are disguised as just another part of the adventure–which is the best possible way to implement a tutorial. Everything outside of the most crucial game mechanics receives no tutorial at all; you either discover it as you play, or you learn about it in a brief, arbitrary hint provided during the short loading screens. Alternatively, you might never learn the mechanic exists at all. For many games, such a setup would make no sense because every element of gameplay is crucial to progressing. But Breath of the Wild is packed to the brim with mechanics that merely exist to enrich the experience for the players who uncover them. Shield surfing is a prime example–you don’t ever need to shield surf down a hill or a mountain if you don’t want to, but the option exists if you figure out how to do it on the controller. You also don’t ever need to cut down a tree to create a bridge, or use a metal object as a lightning rod in a storm to summon down electric death upon nearby enemies–but you can if you want. And that’s incredibly exciting! It also ties very closely with my next point. Anybody lose a giant glowing ball around here? 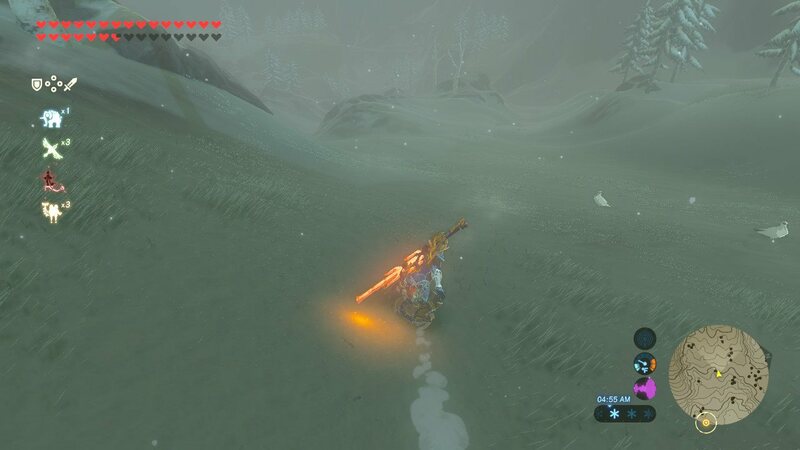 Breath of the Wild has what I would describe as the very first organic world in a video game. By organic, I mean that the world just makes sense from a natural, human perspective. For instance, unnatural barriers don’t exist for Link anymore: There are no invisible walls, and Link can climb nearly anything, from mountains to the walls of Hyrule Castle itself. If you see it, you can conquer it. Another huge way in which the world feels organic lies in what Nintendo describes as the game’s “multiplicative gameplay” and “chemistry engine.” This is a fancy way of saying that everything in the world interacts naturally with everything else, resulting in a mind-boggling array of potential events: High temperatures burns wood and grass. Fire creates updrafts. Rain extinguishes fire. Frigid temperatures freeze meat. Metal objects yield to magnetism and can be used to pulverize enemies or create new walkways. The examples go on and on. Likewise, the solutions to challenges are equally numerous. There are dozens of ways to approach a battle. There are dozens of ways to decide how to travel to a distant location. And awesomely, there are even multiple ways to complete the game’s myriad puzzles (both in shrines and for Korok seeds). The result of this extraordinary amount of freedom is that all of your victories feel earned. You seldom feel like you’re just doing what the game designers intended; it often feels like your accomplishments are a direct result of your skill and your imagination. This is, to my mind, an unprecedented accomplishment for a video game, and it is the chief reason why I believe Breath of the Wild is the current greatest game ever made. Granted, yes, a bit of cartoonish surrealism and exaggeration still exist in this game world’s “natural” interactions–but only ever to the player’s benefit. It definitely makes no sense that freezing a boulder in time and giving it a few good whacks is enough to launch it like a rocket, but dang if it isn’t fun to do! “Concessions” like this one only make the game even better, and demonstrate masterful design precision by the development team. I took this photo for the sake of drama. In reality, I would have bomb spammed them to death in seconds. Especially if you play a lot of Ubisoft games (and honestly, I don’t), it becomes pretty apparent how big a trend that open-world games have become. I personally am sick of this trend, with my regular criticism being that too many open worlds are made “open” by featuring lots of arbitrarily empty spaces. But again, Breath of the Wild never falls into this trap: There is stuff to explore and discover everywhere, because you never know where another shrine (or at least a Korok seed) will turn up in the multifaceted landscapes. I spent over 120 hours playing this game, and most of it consisted of me just walking around and exploring new places! It never felt like a chore either, which is something I can’t say of the repetitive monster hunts in The Witcher 3: Wild Hunt, even though that’s a brilliant game too. Breath of the Wild represents an open world done right, and since you receive all your tools from the get-go, nothing ever impedes your exploration or your imagination. 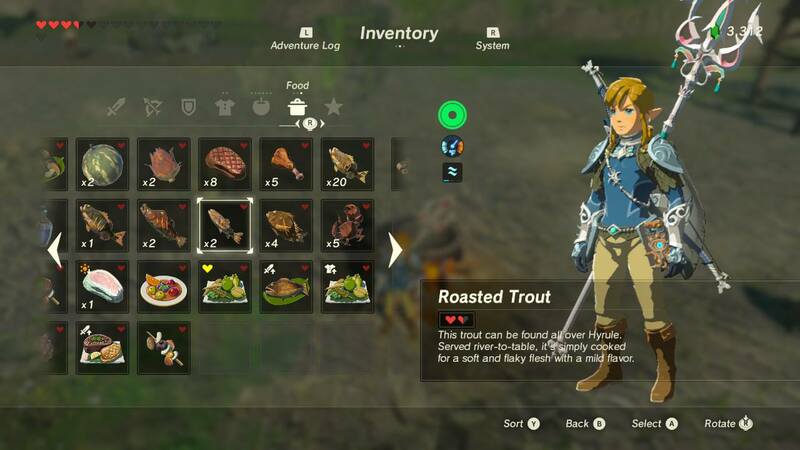 Interestingly, Bioshock creator Ken Levine goes so far as to praise Breath of the Wild’s even loot distribution throughout its world, and says that many games stumble in this regard. This area however would actually be where I begin my constructive criticism of the game: I believe much of Breath of the Wild‘s treasure is underwhelming. I could only get excited to find a Fireblade in a shrine so many times, after all, especially once I’d found the right places that let me farm all manner of useful weapons. And while it remained consistently thrilling to find a weapon or shield that eclipsed the stats of my other items, such events occurred more infrequently as the game went on. It reached a point where the only times I ever got really excited for new treasure was when I found the one-of-a-kind stuff (armor, typically). Unfortunately, the source of underwhelming treasure is also the source of spectacular freedom in the game world, namely, that you receive all your tools from the get-go. The tools are the most exciting treasures by far, and by receiving them first, everything else feels a little less interesting. Of course–as evidenced by my 120 hours of play–this did not hurt my enthusiasm for the game, but it is certainly a point for improvement in future games. The question of course is–how does Nintendo improve it without robbing the game experience of Breath of the Wild‘s unmatched freedom? Well, to start, I would simply recommend that the game provide an even greater wealth of armors with unique effects to collect. Perhaps Link could also learn more advanced combat abilities (like a jump kick) that are not integral to progress but make for exciting unlockables. Heck, even discovering furniture as treasure in a future installment might be satisfying, if Link is given the option to buy a mansion the next time around. These would all provide fun, expanded incentives to explore without inhibiting Link’s freedom in any way. 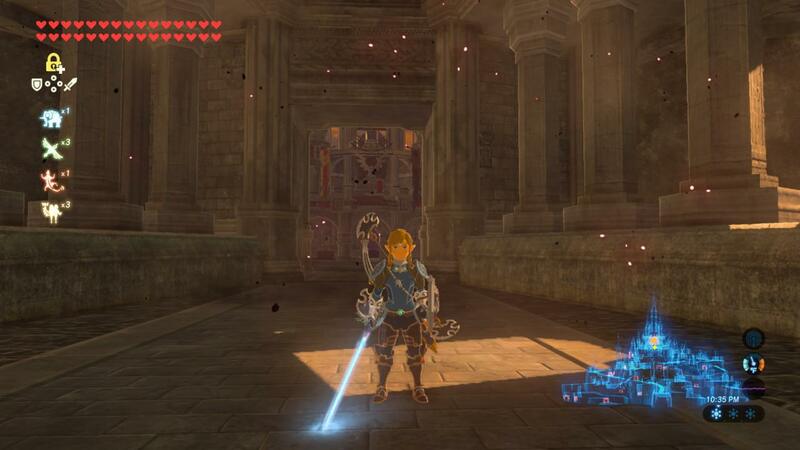 Hyrule Castle was a perfect capstone dungeon–beautifully crafted, yet as skippable as everything else if you so chose. Some people bemoan the subdued story in Breath of the Wild, which is relegated largely to collectible memories from Link’s past. These people feel that strong story is a hallmark of the Zelda series. And I… respectfully can’t share their perspective. The truth is that, until this current game released, I had not finished a console Zelda game (as opposed to the many portable titles) since Ocarina of Time. There is more than one reason, (The only reason I didn’t finish Majora’s Mask is because of my distaste for time limits, actually.) but a major one is that the games’ plodding exposition and story-building got to be too much for me. I just didn’t care about the characters or stories that were being imposed upon me, and I longed for the simpler days of A Link to the Past, where gameplay always took precedent. That’s not to say I don’t care about stories in video games; JRPGs are far and away my favorite genre, and I think Final Fantasy VI is a masterpiece of storytelling. But the stories in Zelda games particularly have had a bad time holding my attention. 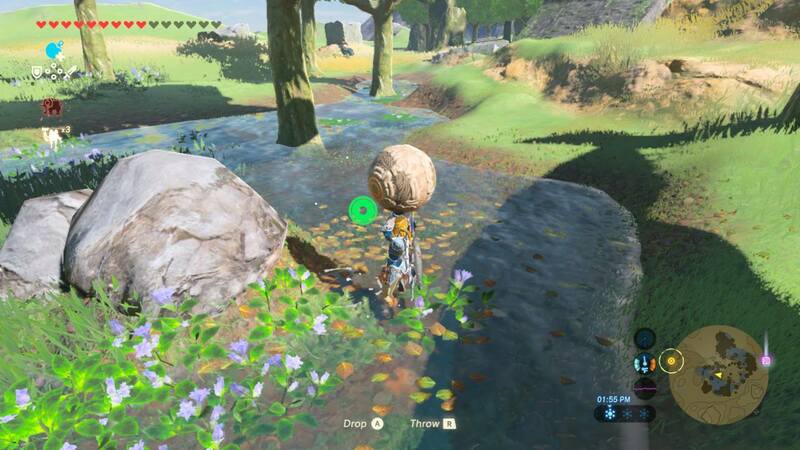 Breath of the Wild however circumvents this problem spectacularly–in my perspective–by only showing you the highlights and letting your imagination fill in everything else. It’s Hemingway’s iceberg theory, but applied to a video game. For instance, who can forget the memory where Link and Zelda are standing around a sea of dead enemies? My mind immediately raced to imagine a scenario where Link obliterated them all in devastating fashion, and it gave me an awesome sense of the warrior that Link truly is. 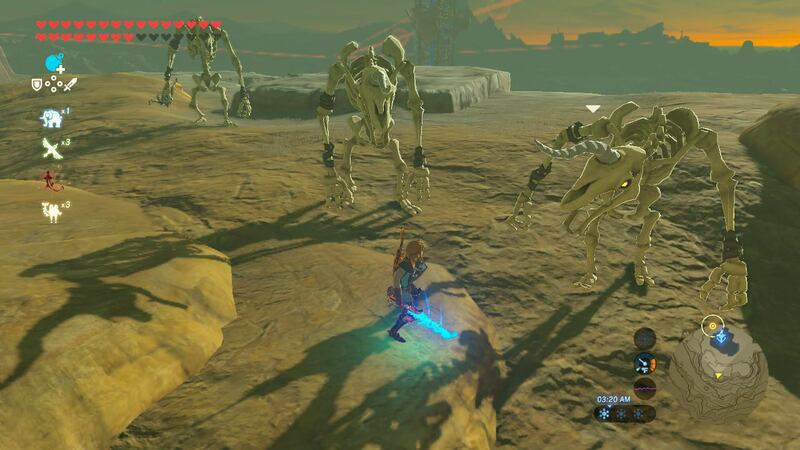 Yes, Nintendo could have just designed a scene showing Link slaughtering everyone, but I’m glad they didn’t! Because I’m pretty sure the scene in my mind is a heck of a lot more fun, and such a scene would have been too brutal for the ultimately gentle aesthetic of the Zelda series anyway. I loved that the memories only focused on critical “before” and “after” moments, allowing me to imagine my own version of the events from 100 years ago. And I’m thankful that Nintendo was willing to let me as the player become an active participant in the creation of the narrative. That being said, I can easily admit that Breath of the Wild has a pretty uninteresting cast of characters overall–the same as most Zelda games. In the future, if a Zelda game could strive to have characters as realistic as those in The Witcher 3 or as exotic as those in the best Final Fantasy titles, that would be pretty awesome, but I won’t hold my breath; story just isn’t Nintendo’s strong suit. And that’s okay! I’m not going to demand that Zelda have characters like Final Fantasy VI or major branching storylines like in Dragon Age: Origins, because Zelda isn’t known for those things. Zelda is known for world-class game design… which is pretty much good enough. Can I really risk eating that fish? WHAT IF I RUN OUT?! It was my own stupid fault that I held on to my best weapons for so long. I could have ultimately made do regardless. Besides, there was one weapon I kept on me for probably 50-70 hours, and once I finally used it and broke it against a particular enemy, I felt supremely satisfied that I’d dedicated the weapon to a worthy cause. So if anything, the silly weapon breaking helped to enhance my story experience even a little bit more. Do I think a better weapon system might be possible in future Zelda iterations? Absolutely I do, but I can’t envision it right now. Thankfully, that’s Nintendo’s problem, not mine, but I wouldn’t be heartbroken to see it remain largely unchanged in the next iteration. One thing I do really need to see in the next game though is more enemy diversity. Because in spite of the many varied landscapes you discover, they all seem to be populated by the same enemy types (albeit color swaps). Even the “boss” enemies roaming around get to feeling more commonplace than they should. But on the bright side, the enemies that do exist have superb AI; I would always chuckle when monsters would tiptoe around my bombs or kick them out of the way. The Legend of Zelda: Breath of the Wild is a revolutionary new pinnacle for video games, and I think game developers across the world are vigorously taking notes right now on how to incorporate aspects of it into their own games. I wager that what enamors me about Breath of the Wild now will actually become commonplace within three-to-five years, in a delightful act of cross-pollination/eager theft. But suffice to say, I’ve played a lot of video games, and I’ve never been so curious or excited to see what shape a video game sequel might take than I am with the next Zelda title. Because how the heck do you improve on something like this, while keeping it as fresh and exciting as Breath of the Wild? I don’t know, but I hope Nintendo has the answer. I’m glad you finally admit your hoarding problem to the world. Nice article guy. I’d love a Zelda with the same density of plot and conversations and story development of Fallout games. More armour variety, perks and customising options would also but great. Great article. Thanks for reading, Xavier! A story-heavy Zelda of that caliber is honestly hard for me to imagine, but I’d be super curious to give it a shot!